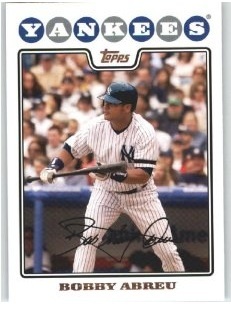 Bobby Abreu gave the Yankees two and a half seasons of solid play as their starting right fielder. He averaged .295 while in pinstripes, stole more than 20 bases a season, was never hurt and he both scored and drove in over 100 runs in each of his two full years in New York. I was expecting him to be a better defensive outfielder than he showed as a Yankee but when you look at his overall performance, he did absolutely fine. Unfortunately, fine was just not good enough for a Yankee team that slowly but surely forgot how to win in October. I liked Abreu’s game but I liked the game of the guy he replaced in right field for New York, even more. That would be Gary Sheffield, who was in my opinion one of the most intimidating hitters in the big leagues. Opposing pitchers respected Abreu but they feared Sheffield. So when the Yankees let Abreu walk after the 2008 season, I was not too upset. He signed with the Angels and had a typical very good Abreu year in 2009 before slumping significantly in 2010. Bobby was born in Venezuela on March 11, 1974. This very flaky former Yankee pitcher and this long-ago outfielder were also born on March 11th.